I love this picture from Frankfurt, Germany with both flags, city and country. Frankfurt is a fun place to start your overseas trip. 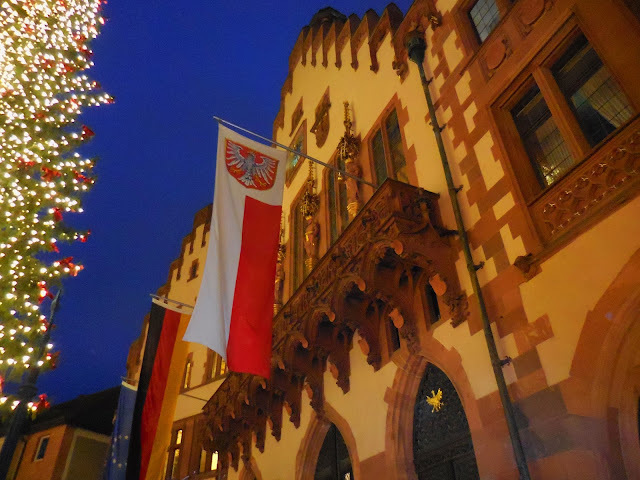 I enjoy Frankfurt because it is a mixture of (of course) a modern day city with an old world charm - this makes it easy for me to make the adjustment and transition after a long flight before I start my vacation. I use these modern day amenities (food, banks, and shopping) while I get ready for the rest of my trip. Frankfurt also conveniently serves as a transportation hub for Germany with air, rail, and other transport ways. What do you like about Frankfurt, Germany? Let us help you with trip and itinerary planning! You may book your own hotels too! We donate a % of proceeds to Alzheimer's Association for future research. Need a hotel room now? Are you a self booker? Books online with us and you will pay it forward to YOUR favorite charity! Thank you!